The wait is over. The hints are done. Cut the Rope has been released for Android, and it's available exclusively on GetJar. If you've yet to play it, it's a simple premise: A piece of candy dangles from a rope. 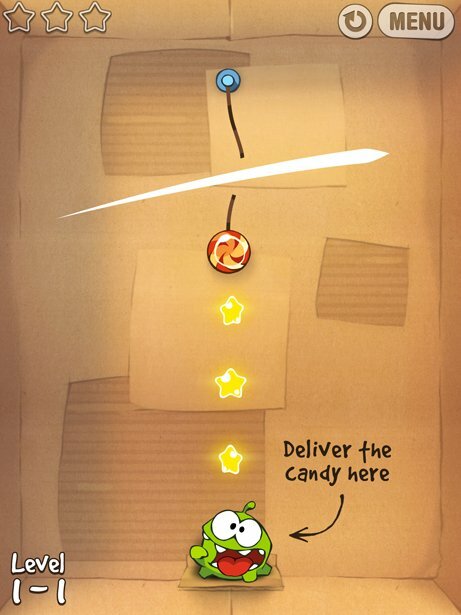 Your job is to cut the rope and drop the candy into the little frog-thingy's mouth (his name's Om Nom, by the way). Sounds simple enough -- and the game play is so intuitive, my 4-year-old loves this thing -- but the latter levels can be a bit tricky. And speaking of levels, there are 175 of them, so you'll be busy for a while. Give it a whirl. For the low, low price of free, you can't go wrong. Full press release is after the break. SAN MATEO, Calif. – June 24, 2011 – Cut the Rope, the award-winning game from mobile game development studio, ZeptoLab, is now available for Android devices and is launching exclusively for one week as an ad-supported, free game on GetJar, the world’s largest free app store. The hugely popular app was an instant phenomenon in the iOS App Store, reaching the #1 spot globally, and recently won the coveted Apple Design Award for the Best iPhone Developer showcase as well as a BAFTA award for Best Handheld Game. Cut the Rope for Android will be distributed widely on additional app stores following the GetJar exclusive. Cut the Rope is an addictive, physics-based game that appeals to all ages. Om Nom, the adorable and ravenous little green monster, has one passion - candy! Players must cut an increasingly complicated series of ropes to release candy into the mouth of Om Nom, while capturing a series of stars on the way down, in this highly innovative and stimulating puzzle game that combines outstanding physics, 175 tricky levels, and fun, colorful, high-definition visuals. GetJar, which has amassed nearly 2 billion downloads across 190 countries, is a popular resource for exclusive app launches among game developers. Unlike other app stores, the company offers developers a global consumer audience that is eager for free, hot games and other applications. GetJar is the world’s largest free app store with more than 1.5 billion downloads to date. The company distributes more than 150,000 mobile applications across a variety of operating systems including Android, Blackberry, Java, Symbian and Mobile Web. In 2010, GetJar was named a Technology Pioneer Award Winner by the World Economic Forum and listed by TIME magazine as One of the 10 companies that will change your life. GetJar is headquartered in Silicon Valley with offices in the UK and Lithuania. For more information, please visit www.getjar.com and follow us @GetJar. ZeptoLab is a mobile game development studio responsible for the creation of the worldwide sensation, Cut the Rope, and the award winning, Parachute Ninja. Founded by brothers Efim and Semyon Voinov, and based in Moscow, Russia, ZeptoLab develops addicting and fun games for the iOS and Android platforms. The creative designers and engineers at ZeptoLab have redefined mobile gaming with unique physics-based gameplay that capitalizes on touch technology to engage die-hard and casual gamers alike. For more information, visit www.ZeptoLab.com.